Cheapass Games, how you’ve been missed. Now you’re back, and with an imprint called Hip Pocket Games. James Ernest and his friends are adept as no one else at taking a simple idea to market. 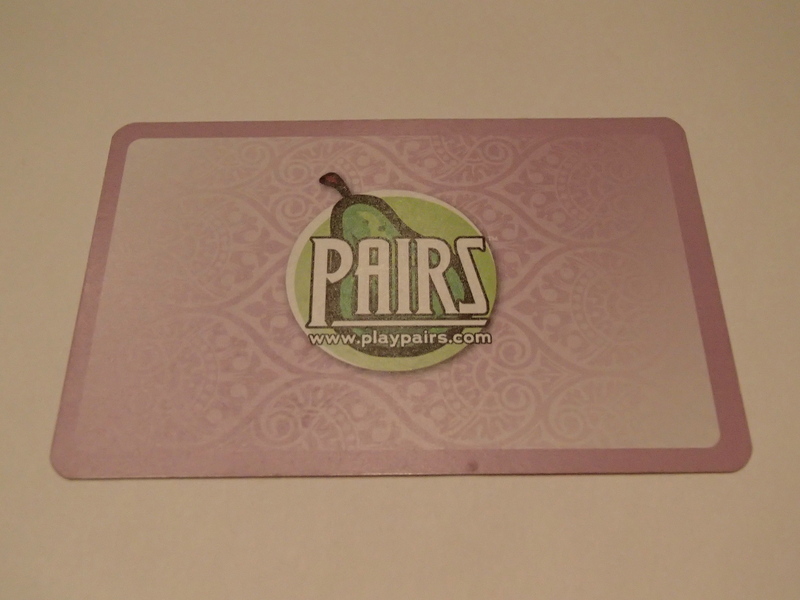 Pairs is a quick, easy card game of pressing one’s luck. There’s not much intro to it because there’s not much that needs saying. So . . . The object of the game is to not lose. That’s right, there are no winners and only one loser to Pairs, and you don’t want to be him. Up to eight people can compete to not be the loser. 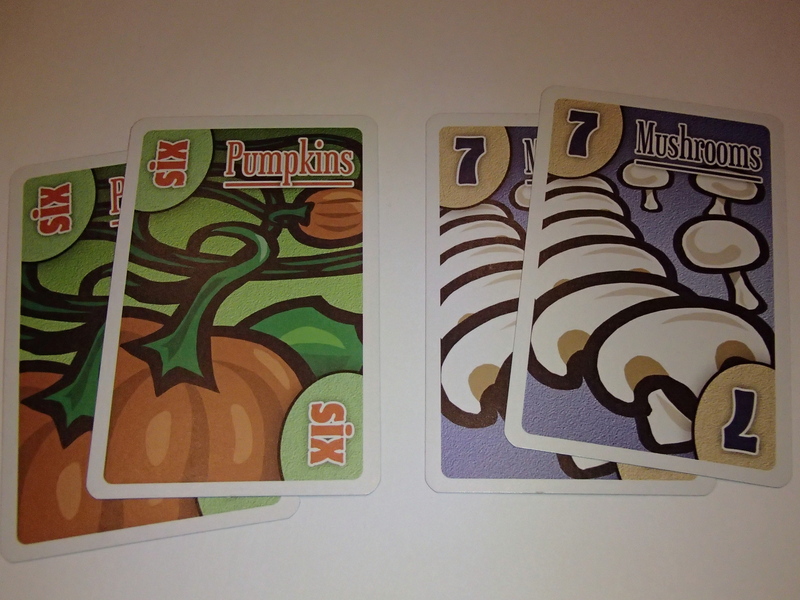 The action begins with a deck of 55 fruit-and-vegetable-themed cards numbered 1 through 10. See if this pattern starts to sound familiar: There is one 1, two 2s, three 3s, and so on. The dealer kicks things off by shuffling, throwing five cards facedown into the center of the table (now the discard pile), and dealing everyone a single card face-up. The lowest card goes first. A player can hit or fold. If he hits he takes a card from the deck, and if it’s a different value from the first one he was dealt he’s in the clear. If it matches the card he has, he’s made a pair and that’s bad news. The round is over, everyone discards to the center of the table, and the unfortunate soul has to keep one of the cards he matched to indicate his current score – if he matched a pair of 4s, for example, he keeps one to show he’s now got four points. You don’t want points, because the lowest score is, uhm . . . the best not-loser, it seems. If, on the other hand, he doesn’t like his odds, he can skip hitting and just fold. The result is the same – the round is over and everyone except that one unfortunate soul gets rid of their cards – save that instead the player gets to take and keep whichever face-up card he likes (not the cards that have already been scored and set aside; those are busy making other people unhappy). He takes the lowest card from this round (unless he has serious math issues) and keeps it to show his score. This press-your-luck party continues around the table. Players don’t want pairs, but even if they don’t get a match it just means they now have another card that might pair up on his next turn – a little more of the deck has turned perilous. Matching a low card is unlikely, and even then it’s just a few points. Higher cards are easier to match, and are worth more terrible, terrible points when they do, so the temptation is there to fold early if someone at the table has a really low card they can settle for. Eventually all good things must end, and the first person to hit a preset point limit is the loser and must buy the next round of drinks or wax your car or whatever indignity was agreed upon. James Ernest has lost none of his insouciant sense of humor. In order to distinguish easily between each suit, every number in the game is a separate fruit: The 5s are grapes, the lemons are 8s, etc. There is but a single 1 card, so it by definition cannot be matched. Its suit? Pears. The graphics aren’t just nice, they’re well managed to make telling one from the other something one can do at a glance, most just by their vibrant colors. Even setting aside the fine illustrations, the numbers in the corners are quick to establish which set is which. The 9s and 6s, bane of card-game designers everywhere, are distinguished because the 6 is spelled out and runs up the edge of its cards. Pairs comes with a cut card to hide what the bottommost card is, though the rules don’t make explicit the problems this solves (unless, perhaps, you’re playing at a glass table; you could always give it to the person who should next get a card after the dealer reshuffles, as a placeholder). Sure, there are plenty of press-your-luck games to contend with, but it’s their very fleeting and not terribly strategic nature that makes so many of them so much fun. It’s also nice to have a game where most anyone can “count cards” to some extent when considering their strategy. The tension in Pairs may be short-lived but it’s so fast either your next turn or the next game is right around the corner anyway, meaning you’re going to get your adrenalin fix again any moment now. That rush keeps people coming back to this one like they were hitting the tables in Sin City. 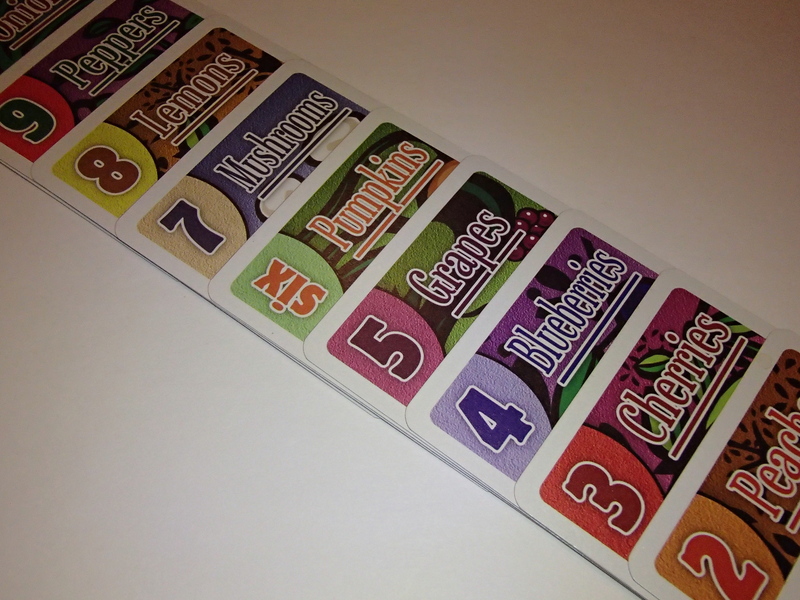 If two players tie for going first (both have the lowest card), the tie-breaker is a bit clunky and unsatisfying. Each such participant gets another card to break the tie. While they cannot catch a match on this deal (they won’t lose outright), they still have two cards to everyone else’s one going in. Don’t like the fruits and veggies theme of the game? A variety of artists have contributed to a slew of versions for the same basic set of rules. You can play pirates, Las Vegas, old Cheapass mainstay Lord of the Fries, chap hop hero Professor Elemental, and more. Of course, all of them demand the blood of one loser, so don’t think you’re getting off light. If one form of the game loses its appeal the rules list tweaks and variations, the various iterations have rules all their own, and there’s a whole website for the game with even more content. 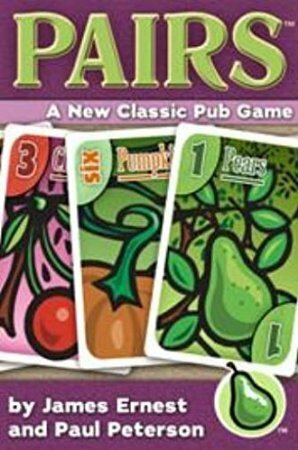 Considering all the material given freely to players interested in switching things up, one can see why Pairs is entertaining, and why Cheapass leads the pack in low-budget fun.